No human being exists without a Light Body and an energy field. It is not possible, actually, to be an individual Soul without a Light Body. And it is impossible for a Soul to explore any reality in form without the energy field, including here on Earth, because it is the energy field that generates the physical body, not the other way around. 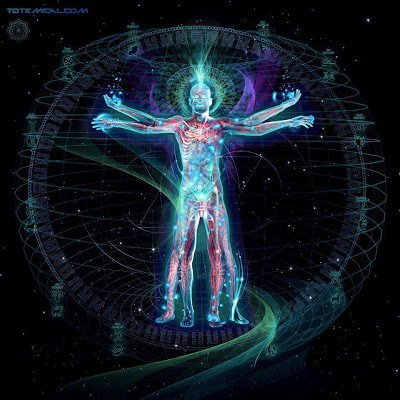 In simple terms, the Light Body is a Soul component, a crystalline energy structure that holds our essence; the energy field is the oval shape bubble of multiple bodies of different frequency ranges, through which we feel, think, and know; all of these contain the matter-body, which is the material body we see. All of our bodies are composites of all of our experiences through all incarnations. The sum of these experiences is encoded as a unique personal resonance – a vibrational signature of individuality. The Light Body is not the same as the energy field. Our personal learning is contained in the energy field, while our bigger plans for who we are are contained in the Light Body. Ability for multi-dimensional travel (i.e. releases the limitation of this dimension, allowing us to shift our perception dimensionally at will). How do we activate the Light Body? – By increasing the Light quantity within our system. How do we increase our Light? – That is done through the internal work of aligning yourself with the Higher Self, investigating personal issues, defenses and fears of the Lower Self, challenging them and transmuting them into harmonious frequencies, releasing judgment and separation while lovingly supporting your own journey of awakening. Spiritual development is represented in both vibrational frequency and atomic structure. Space between electrons, protons and neutrons changes as the Light expands within the atom. This Light reflects a person’s awareness of their Divine Soul-Self. As the self-awareness grows, the Light expands to fill the space in each atom, changing the frequency (rate of oscillation) of each atom in the body. The transition into a higher dimensional state is a process. We are not matter one day and Light energy the next. Our energy fields have to be infused and aligned with Light gradually, so as not to experience electrical burn out. The process of building and activating the Light Body is mandatory because it is linked to planetary evolution. Our planet upgrades her Light Body periodically, and we “upgrade” our Light Bodies as she upgrades hers. We are transmuting our denser confused energies into Light, and in doing so, becoming more Light ourselves. Some people are consciously working on absorbing Light and transmuting disharmony, therefore their Light Body transformation is quicker. Others are unaware, but they are still absorbing Light and experiencing some transmutation, echoing the planet. If we apply effort to our spiritual development, we resonate better with the universal energies, which then can further support our journey of awakening the Light Body.